have got a new blog! An interesting snippet from the Catholic Herald, about the Birmingham Oratory. The Maryvale Institute is, of course, located in Birmingham. 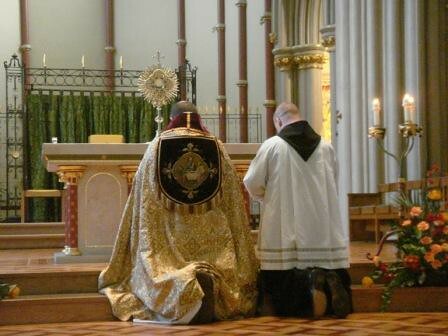 “It also announced that Fr Anton Guziel would become parish priest, replacing Fr Guy Nicholls, who has been in the post for 10 years. The statement said that Fr Nicholls would be setting up a school for liturgical music in partnership with the Maryvale Institute. 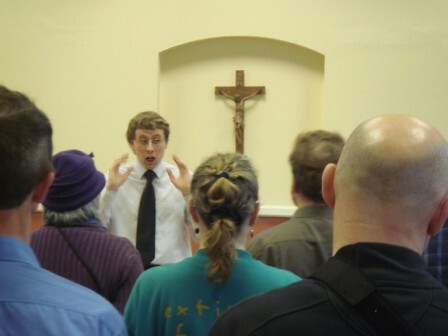 (Chris Hodkinson leading a Chant workshop in Portsmouth Cathedral). 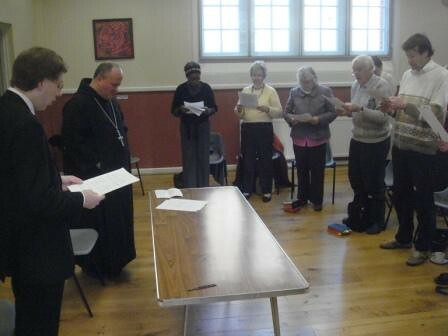 More than 100 different people have attended one of the current series of Chant Workshops organised at St John’s Cathedral in Portsmouth by the Schola Gregoriana Sancti Nicolai (chant choir in Portsmouth). 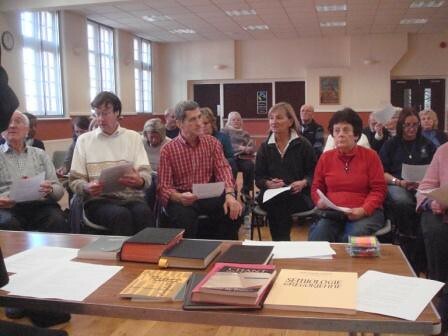 The Workshops are part of a pioneering Course in Gregorian Chant which continues at the Cathedral until June 2011. Each Workshop introduces a new theme. At the January Workshop, Abbot Cuthbert Brogan, the Benedictine Abbot of St Michael’s Abbey in Farnborough - who co-directs the Course with Christopher Hodkinson of the Schola Gregoriana of Cambridge - gave a fascinating introduction to the Divine Office (the daily prayer of the Church) and Vespers. This was followed by practical instruction in singing Vespers which the participants then sang together with Benediction in the Cathedral. Up until now, participants have learned to sing the Chant without any accompaniment. At the next workshop on Saturday 19 February we will welcome the organist Neil Wright, who will introduce us to the organ and its use in conjunction with Gregorian chant. There will also be an opportunity for a small group of participants with keyboard skills to study chant accompaniment with Neil in more detail, beginning at this workshop and continuing in March (please contact me if you are interested). The March workshop, on 19th, will see a further exploration of the use of instruments in plainchant performance, as we celebrate the feast of St Joseph. Players of melody instruments (strings, brass, woodwind etc.) are invited to bring their instruments to both February and March workshops to participate in this. Players of low-register instruments (cellos, trombones, bassoons etc.) are especially welcome. Instrumentalists are requested to bring a music stand. (Please contact me if you plan to bring an instrument or if you have any questions). Every effort has been made to keep the Course fee as low as possible. For those who haven’t yet signed up, the individual Workshop fee is £15 and the course book (Parish Book of Chant) is available at discounted price of £10. Reductions on the Workshop fee are available for students, children and groups. Bursaries are also available on application. Next Workshop is on Saturday 19 February, starts 1000. A fascinating article based on numerous historical sources on rythm in the chant, by Alasdair Cordona of Salmaire, Gregorian Chant Study and Performance Group (Edinburgh), can be read here. Only rarely do we read hints that chant may have been rhythmically differentiated, and only in two instances are there remarks about the choir singing in strict proportional rhythms. Sometimes silence may speak volumes, but an argumentum ex silentio is weak for all that. Is it true that only rare hints and an argumentum ex silencio support the use of proportional durations in Latin chant? Or is it rather the case that there are only rare (and condemnatory) descriptions of rhythmic nuancing and an argumentum ex silencio supporting that instead?